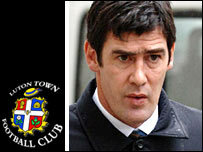 Luton have sacked manager Mike Newell with the club battling against relegation from the Championship. The club dropped to second from bottom in the Championship after being beaten 2-1 by Hull on Tuesday. Newell criticised the Kenilworth Road board after the game and blamed Luton's plight on the fact that he has had to sell the club's best players. Former Luton player Brian Stein will now take temporary charge of the club until a new boss is found. A Luton statement said Newell's contract had been "terminated with immediate effect". Who do you think will replace Newell? The club added: "There will be no further comment at present but there will be a further statement in due course." Luton have lost their last five games, including the 2-1 defeat to fellow strugglers Hull and a 1-0 loss at a Leeds side also battling the drop. Cutis Davies, Rowan Vine, Carlos Edwards, Steve Howard and Kevin Nicholls have all been sold during the past two seasons. Newell cited this as a major reason for the club's downfall combined with the majority of the funds from the departures not being made available to him. "The reason we're in this position is because we've sold our best players," he said after the defeat to Hull. "Where's the £9m gone? Give that to me and I'll get five experienced players in, I'll pay them fortunes and we'll get ourselves out of it. "It takes three or four years to build a reputation as a decent manager and three months to lose that reputation. But if you take the four best players out of any team it will hurt them." Newell has been a controversial figure in his time at Luton and is famous for his comments criticising the practices of certain agents in football. He was also fined for an outburst against female assistant referee Amy Rayner in November 2006. Luton midfielder Ahmet Brkovic said: "I am surprised and disappointed to see him go. "It is upsetting news, and I want to get in touch with Mike and thank him, because we had a good relationship. "We need a new manager, but who knows whether the person they appoint will make any difference, because it is not just about the manager. "As players, we have to take responsibility, because we are the ones who go on to the pitch. Whoever comes in will need the players to give everything to get us out of this situation. "It will not be easy to keep the club up."